Tired of Ads? 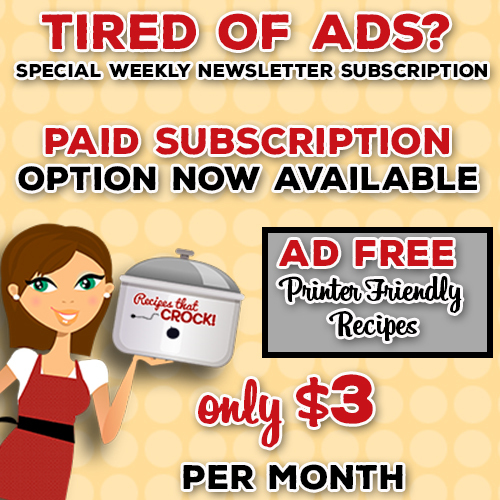 Try our Special Monthly Subscription Ad-Free Newsletter - Recipes That Crock! Do you hate ads on our recipe posts? We are excited to finally be able to offer readers another option. We are going to try offering a paid subscription option for those of you that would like to receive our recipes without having to deal with ads. Our new PAID subscription service is for Recipes That Crock readers who would like to access our weekly newsletter recipes ad-free. Your monthly subscription fee of just $3 allows you access to sign up for a special weekly newsletter that provides direct links to printer-friendly versions of Recipes That Crock’s featured recipes for the week. All of our Weekly Meal Plan Recipes that week. Direct Links to Printable Instructions for All Our Featured Video Recipes. Several Tried and True Reader Favorite Recipes from our site of over 500 Crock Pot Recipes! Additionally, as a current paid subscriber, you will also automatically receive any $1 e-books we create in 2017 for free as a special thanks for being some of our first paid subscribers!